Definition at line 1178 of file mysqlpl.h. Definition at line 1180 of file mysqlpl.h. 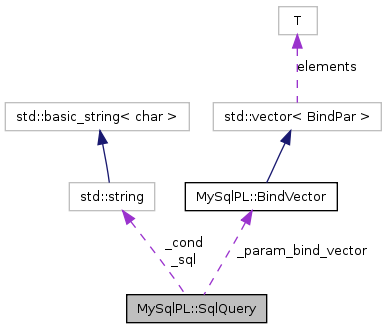 Definition at line 821 of file mysqlpl.cpp. Definition at line 1202 of file mysqlpl.h. Definition at line 1195 of file mysqlpl.h. Definition at line 1185 of file mysqlpl.h. Definition at line 1209 of file mysqlpl.h. Referenced by get_sql(), and where(). Definition at line 1211 of file mysqlpl.h. Referenced by bind_param(), and get_params(). Definition at line 1208 of file mysqlpl.h.